Low Cost Polluting: The Real American Dream? It’s an open, dirty secret, swept under the rug by environmentally conscious and climate-denying consumers alike. Rich and poor want the best deals on low cost polluting, whether it’s cheap air fares or a nice price on a Lear Jet. Low cost polluting in myriad ways is ever-present, guaranteed to be easily available. Even though scarcely mentioned, it is a prime feature of democracy today. The householder scrutinizes his or her electric utility bill, watching monthly costs. Typically people are oblivious to many energy costs when not labeled “energy,” as it is imbedded and hidden. Few are those who bother to counter it by creating passive solar heating or reducing costly waste by composting. The average person especially watches costs at the supermarket, in effect to pollute most cheaply in the industrial food system. Comparing phone-plan charges or cable TV packages, to pollute electronically, is considered far more important than planting a fruit tree. 3) We are itching to do it all again, with a larger capacity sailboat and encompassing more islands and their products. In a fast-changing world, it is no longer possible to automatically assume that what one is used to will endure. People want stability and predictability, but, as they say, good luck with that. We are witnessing out-of-control evolution of a rapid, uncertain sort. Fortunately, there are pro-active initiatives that have seized the imagination of thinking people who think of the Earth as a community to share. They look ahead in terms of decades and even centuries instead of mere days or quarterly periods. Donald Trump has won a bet, perhaps with himself, that a grandiose ego can transcend the world of the business deal and reach the level of nation-dealing. As a sole qualification for being president of the U.S., not to mention his being a white male of a privileged background, this is very slim. Yet, one could point to the refined education and style of ex-president Obama, and lament that someone so intelligent who gained the trust of the pro-peace electorate (and the Nobel committee) kept the wars going instead of ending them. But Trump seems to have a complex world view, and apart from whatever good he might do there is a worrisome Reaganite knee-jerk right wing tendency. Reagan took down the solar panels off the roof of the White House as soon as he was installed, while Trump began dismantling Obamacare. I have been reflecting upon the ascendancy of Donald Trump to the top spot of the U.S. power structure. It has been disturbing to about half the country, and this demographic is further frustrated that not even half of the voters voted for Trump. Many people in other countries are appalled, and some pleased because Trump adds to the humorous or wild aspect of the increasingly rogue former colony. At Culture Change (est. 2001) we have focused on root problems that give rise to the full range of dangers of racism, bigotry, misogyny, war, and ecocide. With the patience of a historian we have to watch the usual complete inaction. Yet every so often a movement or campaign comes along, such as Standing Rock or Occupy to fascinate millions of us. 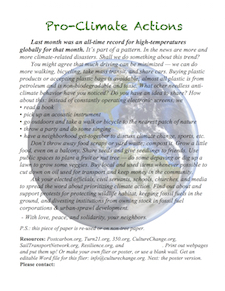 Publisher's note: the following is our position summary available at the current United Nations climate meeting in Marrakech, prepared by Charlene Caprio. Since the UN climate meeting in 1997 in Kyoto, the International Maritime Organization (IMO) eagerly took on the responsibility to reduce shipping’s GHG emissions. The Paris Agreement further kept the IMO in control of maritime GHG emissions, rather than incorporating them into state obligations. Now, we see a continual let down by the IMO going into the UNFCCC COP22 discussions in Marrakech, Morocco. Editor's note: this new piece can be considered Part Two of our Screenism report, Feb. 2015. In past centuries the world’s population knew literacy, a major phenomenon that boiled down to whether you could read or not. In terms of what literacy meant for either the majority or minority, it was a useful or oppressive tool. However, literacy was not an all-consuming status that was never off (always “on”). Today’s telecommunications industry and its ubiquitous products’ usage is a very different phenomenon, compared to mere literacy. There are many differences, but let us focus on impacts on public health and social cohesion, and on the progression of major forms of social control by elites. These are confusing times, for many. We know of very intelligent, well-informed activists who choose to see an aspect of the disturbing reality afflicting us, while ignoring other parts of the big picture. This may be because of stress and fear. Is this scary picture of a multi-crisis an affliction Western Civilization suffers from, or is Western Civilization the affliction? The question should lead people to improve their perspective, in case they needed to. Meanwhile, we can't sit back smugly by concluding, "I understand what's going on, and what needs to be done, but people don't get it." Other common attitudes: "The banksters are too powerful. The elite will always have what it wants." Or, "Hmm, is the presidential election what most deserves my attention as a solid activist?" This is our third article on Turn21, a most promising movement that offers hope for the world in crisis. We believe you would do well to subscribe to the Turn21 newsletter (click here). There comes a time for action on the behalf of the planet, and that time has already begun. Thank you for being part of the solutions, thinking about what you can do to reduce your carbon footprint, supporting sustainable commerce, and thinking of how you can enjoy a great life with less carbon energy. We are putting much hope in our new project for climate protection. Not so far fetched, when May was the fifth month since December to be a record-heat month in known history. People want to act, right? Climate denialists be damned; they have no scientific basis except pseudo science to refute what is clearly happening to the planet. Transport by sea carries about 90% of the world's trade. Consumerism is fueled by vast choices; sometimes very selfish ones. Smugglers often push not just inanimate contraband, but also wildlife (flora and fauna) in whole or in their parts by sea transit. As our readers also know, today's dirty bunker fuel-powered cargo ships are able to supply massive cargo capacity due in part by a web of oil subsidies and lax regulations concerning pollution of the air and seas, as well as “flags of convenience" loopholes. But illegal trafficking of wildlife, and shipping as a transit source for the trafficking, is starting to get the attention it needs. Since it is the 21st of the month, and this is the 21st century, we have a handy reminder -- at least 12 times a year -- that it is time to grow up and face the music. Whether as individuals coping with hardship and injustice in materialistic society, or as a people reacting in many ways to multiple crises, we find ourselves in a fast-changing world that is less and less likely to offer security for all, unless we bring about fundamental change soon. Is Bernie Sanders addressing fundamental change? Is following him, or another appealing reformer, all that we need to solve the environmental crisis that worsens daily with the unbroken political power of industrialists, financiers, and developers?